Today I decided my blog looked too messy and decided to change the theme. I thought the notebook look was fun at first, but got tired of it. I think the new header image is more “mysterious.” Does the accent color of the text in the sidebar match the header in your browser? I think the color is slightly darker in the side, but I also think it’s a good color. Anything lighter wouldn’t show up as well in the text on the side. I do like your new header. 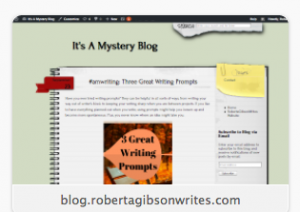 Very appropriate for a mystery blog.